When you walk into the Eel Pie you may think it's an old pub, but it's actually three buildings that were knocked into one about thirty years ago. It prides itself on being a rugby pub, only fifteen minutes on foot from Twickenham rugby ground, and slightly further away from the home of Harlequins RFC. 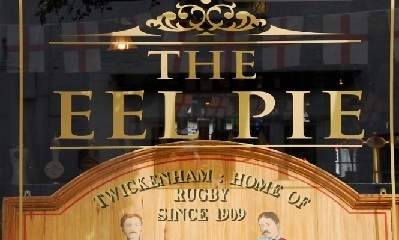 I suppose you don't have to be a 'rugger bugger' to drink at the Eel Pie, but it can't hurt. The pub is owned by Hall and Woodhouse, a Dorsetshire family company that has been brewing for more than 230 years. They supply the Eel Pie with Badger and Tanglefoot ales, as well as other seasonal beers. The food is honest to goodness pub grub, but Jon the manager promised me that they will be introducing a new menu in the summer. He also told me that I'm allowed to mention the refurbishment that will be taking place at the Eel Pie later in the year. The pub is open between 11am and midnight on Thursdays, Fridays and Saturdays, midday and 10.30pm on Sundays, and 11am and 11pm on Mondays and Tuesdays. Food is available between midday and 3pm and 6pm and 9pm on weekdays, between midday 9pm on Saturdays and midday and 6pm on Sundays.